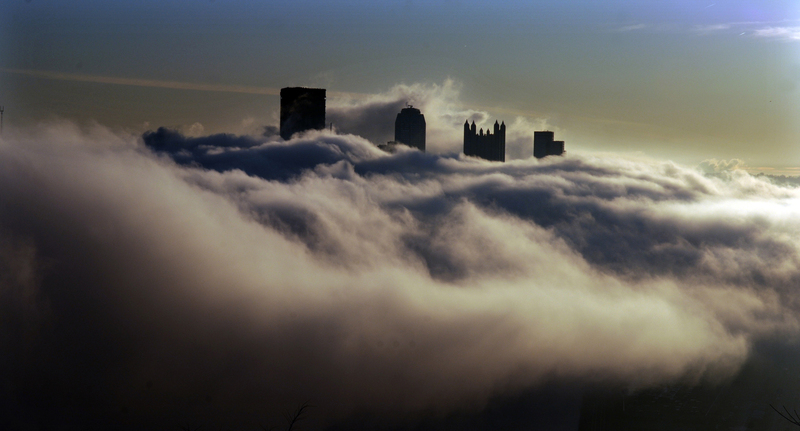 I work the early shift at the Pittsburgh Post-Gazette, so I often get to see Pittsburgh just as she’s waking up. You can go to the same locations time after time and get different views, thanks to Mother Nature’s changing touch. Here are some of my favorite easy-to-get-to vantage points for photographing the Pittsburgh skyline. All along the bike trail along the Allegheny River there are great views. Focus on the David L. Lawrence Convention Center or the David McCullough Bridge. You can go farther upriver and shoot from Washington’s Landing. Across from the Point, the trail offers access to the West End Bridge for another long view — and if you’re lucky, you’ll have a foreground with towboats and their barges. The Schenley Oval in Oakland, east of Downtown, is easy to get to and has a lot of parking. Sunset and the moonrise sometimes line up with the skyline, depending on the time of the year. The crossing from Second Avenue to SouthSide Works has a bike trail as a walkway and clean views of part of the skyline and the Bluff with Duquesne University and Mercy Hospital. It is important to have landmarks and something to show scale. From the north end, frame the skyline with the Birmingham Bridge. From the south end, anchor your foreground with the new marina. Grandview Avenue stretches for more than a mile along the Monongahela River. It offers several different perspectives of the skyline, starting with the profile. From near Shaler Street, you can get the frontal Golden Triangle view punctuated by the fountain at Point State Park. To capture the image on these pages, I started out viewing the skyline from Mount Washington, but the fog was flat and calm. I decided to have a look from the West End Overlook. By the time I got there, the rising sun had caused the fog to become more active, like a roiling ocean. Sometimes you have an idea, but you don’t know what’s going to happen. It’s all about position and timing. For decades, city planners have protected views and shaped the skyline by requiring that the tallest buildings be erected at the center of Downtown; others must be built with heights stepping down to the rivers.